First, you need to point Mailgun's webhooks at Customer.io and get your SMTP information. The Clicks and Opens webhooks should not be sent back to Customer.io as we're already tracking this information on our side and each event will be recorded twice (via Customer.io and via Mailgun). 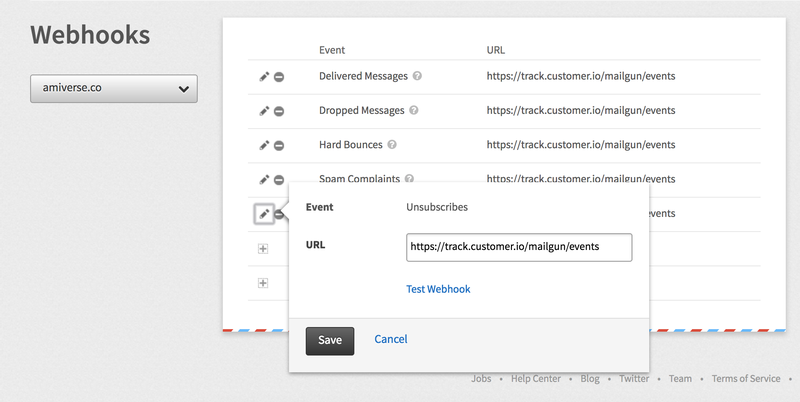 If you want to track opens and clicks via Mailgun only, you can change the sending behavior on an email by email basis. On the main screen for your domain, you'll find your SMTP credentials. You'll need them to configure Customer.io. When you save your settings, we'll start sending emails through your Mailgun account. Your account is now set up to send email through Mailgun. If you have any questions or feedback about setting this up, just get in touch and we'll be happy to help!